People Over 40 Should Only Work 3 Days a Week, Because Science. Falling asleep at the desk. Working hard or hardly working? Australian scientists prove that working over three days a week is actually detrimental for those 40+. The good people at the Melbourne Institute of Applied Economics and Social Research have released a study that, in a perfect world where workers lives were valued more than their time, could make everyone much happier about turning 40. Researchers studied 6,500 subjects and found that those 40+ should be working fewer hours a week, and for good reason. The group compared the number of hours the people work with how well they performed on psychological tests measuring short-term memory and concentration. And in a finding that has everyone of a certain age (which I would know nothing about, of course) jumping for joy in their sensible shoes, it appears a 25-hour work week boosted psychological performance and any more hours than that negatively impacted it. Yes, you read that right: only 25 glorious hours, or about three days, at the office! More than that takes a toll on thinking, attention, and memory. There’s even more bad news for those of you who burn the midnight oil in your cube. Researchers found that those who consistently worked 55+ hours a week scored lower on cognitive performance than people who were retired or unemployed. So, now you have some research under your belt to demand you work less at your next performance review. Your boss may fire you, but either way, you’re working less, right? You’re welcome. 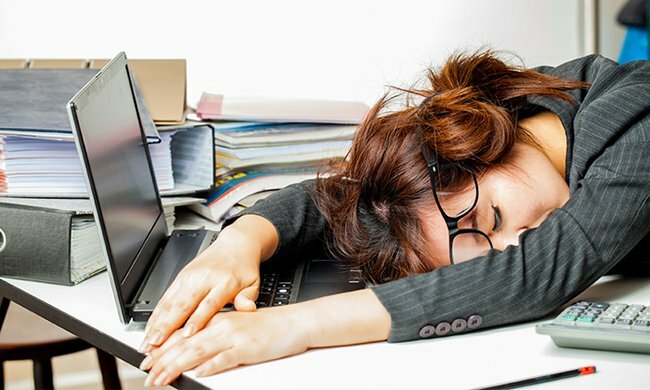 And while it’s true that this is just one study that hasn’t been corroborated by other findings, and results are only applicable to the over-40 crowd, maybe those of us ... er … I mean those of you who fall into this stage of life should spread the word that we’re tired as hell, and we’re not going to take the 9 to 5 anymore!